We've been extraordinarily busy this year (I'm not complaining! ), which has really slowed down my updating work, but I am not giving up and will continue to slog through the stuff I still have to put up. We're still happening here! I've updated the opus list and made some corrections, and of course, we have a new article regarding the Robert Morton V'Oleon, which you may find interesting . . . This website is dedicated to the history, product and legacy of the Robert Morton Organ Company, of Van Nuys, California. 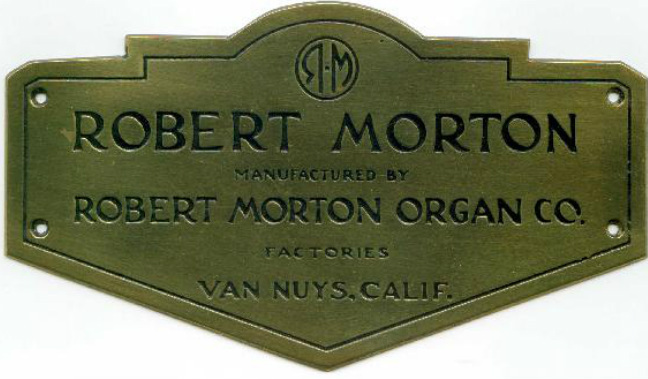 This firm was the ultimate outgrowth of a long line of "brand names" consisting of the Murray Harris Organ Company, the Los Angeles Art Organ Company, the Johnston Organ & Piano Company, the California Organ Company, and ultimately, in 1917, the Robert Morton Organ Company. While the company name changed periodically, the personnel and construction protocols involved with the instrument were generally stable. Draftsmen, pipemakers, voicers, and carpenters who worked for Murray Harris in many cases also worked for Robert Morton. Robert Morton was the second largest producer of theatre pipe organs in the United States, and although its largest instruments have generally not fared well, there are still fine specimens of this excellent instrument extant. It is the attempt of this site to offer the history of the firm, a reconstructed opus list and a census of surviving instruments, and a record of the production of the firm. I am no self-proclaimed expert on the subject of Robert Morton pipe organs, but I offer my research and the research of others in compiling this information. You will find references to my sources in the bibliography included on this site. It is my hope to present the better part of this information in a series of articles, and I welcome submissions and corrections from others who may have information to add. Every bit as much as the famous Wurlitzer theatre organ, these instruments are deserving of respect and preservation for future generations. I've tried to divide this site into sections which highlight a particular aspect of the Robert Morton history, i.e. production techniques, personnel, instruments and so forth. Within these sections, I essentially have articles on specific subjects. Given the amount of material to sift through, this will likely always be a work in progress. Those who have information that would add to the value of this site are encouraged to submit articles for publication. These can be submitted with a byline, or anonymously, as you prefer. I try to give credit and provenance for all of my information sources. Any submissions should provide sources for the information which can then be referenced to the site bibliography. The style of citation preferred on this website is like this example -- (2:413), with the "2" indicating the number of the work listed in the bibliography, and the "413" referencing the page number in that source. If you simply provide a description of the source, I will take care of the citation in both the bibliography and in the article itself. Obviously, anecdotal information should be attributed to the individual who related the anecdote to you, or to yourself if you are the source of the information. I will try to resolve conflicts in information received, but if there is no clear "right" account or answer, I may opt to include both versions of the "facts", so information received later can be used to establish which may be right. I have made every effort to avoid copyright infringement. If I use written material directly, it is because I have reason to believe or know that it is in the public domain. There are a large number of photographs on this site, many of which have been taken by me, but most of which have been sent to me by various contributors. I do try to acknowledge the contributor/photographer of a photo whenever I can. If you find a photograph or document on this site upon which you hold copyright or other rights, please advise me at once, and I will take the item down. In these cases, I would, of course, prefer to be able to use the photograph or document, if we can make such an arrangement. I have no objection to material from this site being reproduced elsewhere, so long as it is not done for commercial purposes. If anyone uses material from this website, I would appreciate the acknowledgement of this site as the source. This site is copyrighted by Greg Rister 2013-2014. You get to see this website "warts and all". As I update, modify or correct, you will find unfinished sentences and raw data splattered here and there. I usually mark these areas with a "construction site" logo, so you'll know that I haven't left things in a mess intentionally. As time goes on, I hope that I will be installing articles and features more as "whole cloth", rather than as "stabs and pokes" of information and data. Bear in mind that I am doing this largely as a labor of love -- I do not receive any monetary advantage from this site. I also have to work on the site when time permits, because I have both a company to run and a life to conduct, and both make fairly regular demands on my time. I intend to be able to offer regular updates, incorporating much new information which I have (but need to transcribe), and hopefully to present the contributions of others. Be patient with me -- things have proceeded in fits and starts for some time now, but I am putting the site up, incomplete as it is, so it has a presence on the net, and to remind me that I have yet another mouth to feed. . .